2 MB|4 Pages- Create an endless number of worksheets! 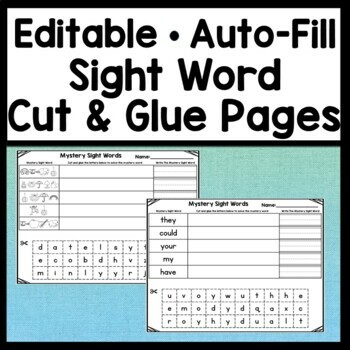 Students will have fun learning their sight words with these editable sight word worksheets! There are 2 editable worksheets in this download. Worksheet 1: You get to decide what 5 sight words you want to use. The 5 words have a maximum of 30 letters. You simply enter in the words and letters into page 1. 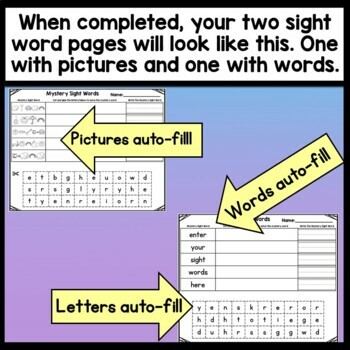 As you type, pictures that match the letters in the word will auto-fill onto the worksheet. Letters for students to cut out will also randomize and auto-fill on the bottom of the page. Students will first solve the mystery word using the beginning sounds from the pictures. Next, they will cut and glue the correct letters on the page using the picture sounds as a guide. Last, they will practice writing the word on the dashed lines. Worksheet 2: You get to decide what 5 sight words you want to use. The 5 words have a maximum of 30 letters. You simply enter in the words and letters into page 1. As you type, the words will auto-fill onto the worksheet. Letters for students to cut out will also randomize and auto-fill on the bottom of the page. Students will cut and glue the correct letters on the page. Last, they will practice writing the word on the dashed lines. Since this worksheet is editable, you can create an endless number of custom sentence building pages! You can use sight words, phonics skills, or content vocabulary for your students to practice. 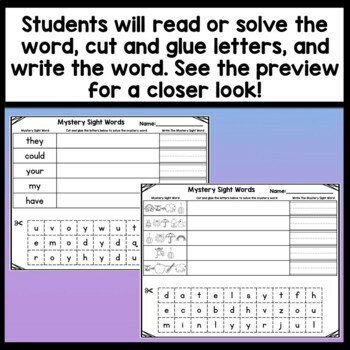 See the preview for a closer look at these worksheets. Want to try an editable, auto-fill worksheet for yourself? 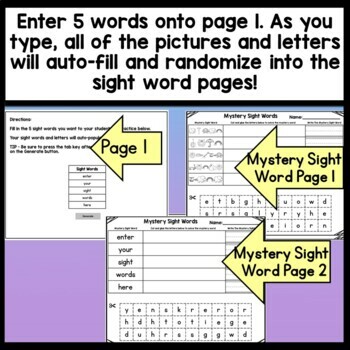 Check out the FREE color by sight word page below! Need more editable sight word activities? Click the links below! 4 Pages- Create an endless number of worksheets!